This is perhaps the most famous of all the Springhill disaster songs, not least because of Seeger’s and MacColl’s high profiles in the folk music world. Having received international news coverage, Seeger learned of the disaster while living in France. She did not record it right away, unlike most of the other Springhill songs, but instead performed it with Ewan MacColl (who helped write some of the verses) while in tour in Canada in 1959 and apparently performed it on a Halifax television show. Rosenberg points out that whereas other Springhill songs reached a more limited regional and working-class audience, this one reached the young, middle-class audience drawn to music of the folk revival. Many other amateur musicians have made their own versions which can be readily found on youtube and myspace. In the town of Springhill, you don’t sleep easy. Often the earth will tremble and roll. Bone and blood is the price of coal. But it’s dark as the grave in the Cumberland Mine. The living and the dead men two miles down. It was three feet high and a hundred long. Hope imprisoned in a three-foot seam. Leaving the dead to lie alone. Two miles of earth for a marking stone. Where can I find the actual music for this song? Is it written down somewhere? Yes, I believe it has been transcribed in Jack O’Donnell’s All the Fields are Green. I’m curious about the next-to-last verse and the use of “passes” instead of “passed.” It doesn’t seem consistent with the rest of the song. Is “passes” the actual word used in the original lyrics? If so, do you know why the change in verb tense at that one point? Oops! That was a typo, which I’ve now corrected. I’ve also updated the page to include a link to the original version sung by Peggy Seeger and Ewan MacColl. p.s. This song has been a favorite of mine since the 1960′s and one of the first that I learned on guitar to sing along with! What of credit for Maurice Ruddick, writer of original poem? This isn’t the song that Maurice Ruddick originally wrote. You can read more about his song here. p.s. Caleb Rushton is my great-great uncle! That’s fantastic! How did the heritage fair project go? While looking for these lyrics I found this wikipedia entry https://en.m.wikipedia.org/wiki/Springhill_mining_disaster. It’s interesting because it refers to “drägermen” rescuers equipped with breathing apparatus and “barefaced” rescuers without BA. I’ve always wondered what the significance of the “shouts of the barefaced miners” line was. Thanks for writing and for clarifying the difference between barefaced miners and dragermen. For anyone else interested, rescue workers can be either barefaced (and usually untrained) or dragermen (who wear special equipment and are trained). Before the development of specialized rescue equipment, rescue workers were barefaced (meaning that they didn’t have any specialized equipment) and they frequently died from exposure to various gases released after a mining accident, particularly carbon monoxide, which is odourless and colourless but fatal in high enough quantities. Specialized equipment, including breathing apparatus, was developed to protect rescue workers when working in a precarious mine. However, the equipment is heavy and cumbersome, making it more difficult for rescue workers to navigate small spaces or to undertake extended physical exertion, such as digging through debris. Moreover, there’s only so much equipment to go around. So barefaced miners still do rescue work in areas that have been confirmed to be safe to work without drager equipment. Peggy Seeger was born in 1935 to Ruth Crawford Seeger. A singer and multi-instrumentalist, she is considered to be one of North America’s finest female folksingers. Her best-known compositions are Gonna Be an Engineer and The Ballad of Springhill. Peggy has made 22 solo recordings, while dabbling in approximately 100 more recordings with other performers. Born Jimmie Miller in 1915, Ewan MacColl changed his name in 1949. His parents were from Scotland and relocated to Salford, Lancashire, England, where MacColl was born. MacColl quit school when he was 14 years old and worked briefly at a number of jobs, including factory worker, builder, mechanic, and street entertainer. He is known especially for writing “Dirty Old Town” (recorded by Rod Stewart and The Pogues), “Freeborn Man” (The Pogues), and his Grammy Award-winning song “The First Time Ever I Saw Your Face,” a hit single for Roberta Flack in 1971 but written about Peggy Seeger. 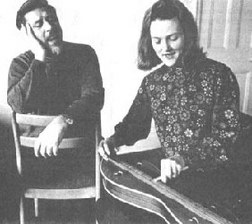 From 1959 onward, MacColl and Seeger encouraged and set standards for the burgeoning UK folk revival; they trolled the USA & UK field recordings and anthologies for little-known traditional songs; they trained other singers and involved them in political-musical documentary theatre; they instigated the revolutionary Radio Ballad form. However, Seeger stopped working when Ewan died in 1989.